In preparing the feature article for issue 5 about poets in schools across Canada, I reached out to expat Michelle Dabrowski in Melbourne with a few quick questions about her experiences facilitating workshops in Oz. She sent me back such thoughtful answers, but as it turned out I had very little room for them in the article. So, I thought I would share them here, along with a couple of other things. One of them is Michelle's contribution to the Poesie78 project. The other is her Pozible (like the Australian Kickstarter or IndieGoGo) campaign that she and poet Joel McKerrow are using to help fund their Canadian tour this summer. Michelle is a highly creative, bright yellow streak of a soul who lives to inspire through embodied poetry. Everyone who gets to see her perform this summer is a lucky camel. Here is the link to their Pozible campaign. It ends on June 18th, Canada time, and if they don't get their entire goal, then they get nothing! Toss a buck in the hat! And the text of my interview with her. Besides the fact that seeing how other countries support the arts, I'm especially intrigued to hear about where her inspiration comes from. Enjoy! Can you tell me what you've been doing in schools/ community groups as far as workshops go? The arts are well supported in Victoria both in an urban sense and regionally. In 2010 I was the recipient of the Arts Victoria, Artists in Schools grant which supported a project I did with Sean M Whelan with grade six students. This is when I was learning about Melbourne's inspiring Street Art scene and affirming my connection to the five elements of Hip Hop. The project supported ten weeks of funding in which we covered a whole range of topics in spoken word from writing in teams, the editing process, voice and movement work to performance skills with a strong focus on the history of oral storytelling and the links to hip hop and slam. In Victoria highschool starts in grade 7 so the graduating students are in grade 6 in primary school. I often things this tends to put more pressure and changes on the students at a younger age as opposed to the way it is in Canada. So this was a real safe way for them to explore their voice and identity as all these changes were about to occure. They also created text based installations from their poetry based on all they had learned about street art. We took them into the famous city laneways in Melbourne and tried to unveil the links between a poet's message and a street artists message in a political context and got them to reflect on who your audience is and how to reach them using the tools from both mediums. This culminated in a final live performance. There were students who wouldn't raise their hands in some of our first sessions-performing on stage with such confidence and passion by the end of the project. I remember the parents being so shocked at the deep ideas and wisdom of their children at the show. So quite transformative work. The fact that the state of Victoria's government has a grant scheme for artists across all artistic disciplines to go in and do this kind of work with school is just phenomenal. 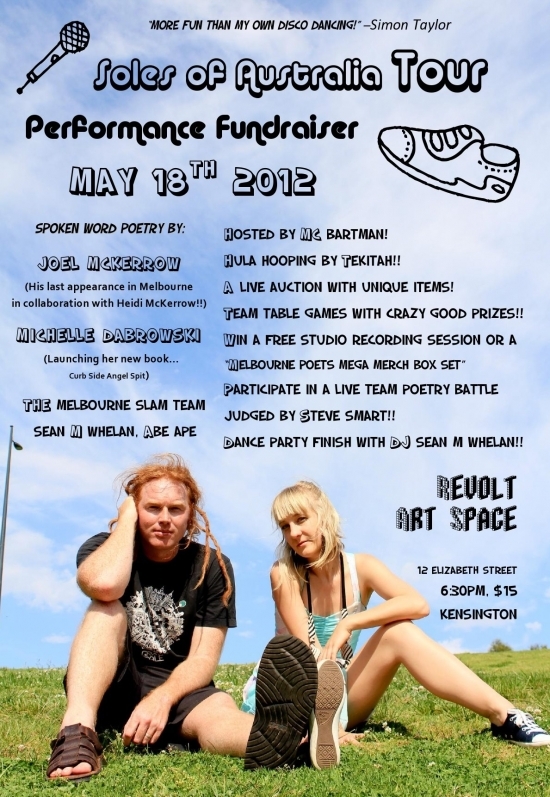 Australian Poetry is another fantastic organization which supports and feuls the poetry movement in Melbourne. Although it supports the more literary focused poets it is based in The Wheeler Centre which is a building which houses quite a few literary/arts organizations and it is positioned right next to the beautiful State Library. I swear- the first time I walked into the libarary-that is the first time I felt at home in Melbourne. Emilie Zoey Baker is a poet who was working as the Education Officer at Australian Poetry in 2010/2011 when "The Super Poets" were born. This is a group of four poets including myself, Emilie, Ezra Bix and Sean M Whelan. Through the organization of Victoria's first ever Teen Poetry Slam, called 'Out Loud' and occuring at the end of August every year... the four of us have been enabled to visit schools and conduct workshops which will hopefully inspire the students to enter a team into the competition. We have a team piece which demonstrates to the students how fun writing and performing as a team can be. We then mentor the students up until the final competition in August. In 2011 we recieved a grant to do an extended residency up in a rural town called "Rutherglen" This is a town full of winery's so you can imagine how much fun we had after a long days work trying to get teenagers excited and emoting. We would go up every few weeks or so and stay for a couple of days to do intensive workshops, help them prepare for Outloud and help get their final year end show together. On some days we visit schools across Victoria as a team and some days we do it solo... it's an extremely exciting challenge visiting remote areas and trying to show the students this art form they know nothing about. I am also a facilitator for the Centre for Poetics and Justice (founded by Joel McKerrow with whom I will be touring Canada this summer) which is an not for profit organization using spoken word poetry as a tool for social change within various communities across the country. I have had the opportunity to conduct workshops for young women in a youth justice centre, hospital wards, brain injury recovery programs and for the wider spoken word community in Melbourne. CPJ runs two double weekend workshops a year where poets in the community really dive deep into their practice. It's a wonderful time. Now that I have been doing this for a few years and really solidifying by understanding of running and competing in slams and the roots of oral storytelling traditions, along with my background in drama therapy, I have become very interested in heritage, lineage, biography and myths and how these elements are present and embodied in performance spoken word. So in January we ran for the first time a Biomythology workshop which gave beginner and seasoned poets a chance to look to their facets of identity for the tools to generate creative exploration in their writing. Because of all of these experiences I'm now able to continue exploring my facilitation styles and methods. I'm at a point now where I am starting an independent workshop series called "Open The Circle" sessions through the events I am running called "Slamalamadingdong." How do these gigs come about? No. The reality is that if you work hard at what your heart is telling you to do you end up taking steps on the path to where you do your best work which serves your community and the world around you. I want to dispel the myths that this cannot be done or that being a artist means that you have to commit yourself to a life of poverty. I think it's also about being an entrepreneur and thinking outside the box. I choose to believe that as the world changes, in where we are heading, we might start to return to giving poetry back it's value. After all, the work I do and many of us do as poets is not in the curriculum and when you have seen how much students benefit from using the poet's tools in life and expressive vocal outreach- well I feel like someone has to teach this and pass on this ancient knowledge and if schools are not doing it and main stream culture is not doing it, it's our job. We are the modern day Shamans. I'm really aligned with Joseph Cambell's thinking that the equivelent of poet's in todays world, in elementary cultures are the Shamans. The Shaman is someone who has an experience which makes them turn totally inward. Then they use metaphors and images to bring this inner world to life. That is what I think young people need to be shown how to do. We stand on the shoulders of so many voices and stories that have come before us. Today we are the one's keeping the myths, stories and oral traditions alive. Are you well paid for your time? Compensation which comes from the arts grant funding bodies pays a decent wage. It is not full time work which occurs every day but it is a nice buffer to help the bills get paid. .
Is access to funds a big problem for thesee schools/groups? I don't think access to the funds is a problem. Sometimes, the problem is getting the schools to understand all the benefits of having poet's come into their school. Sports and leisure are a big focus in Australia so those programs tend to get more attention. Having said that, there are many english and drama teachers who have become really passionate about using spoken word poetry and I have seen foot ball loving physical educations teachers remark how surprised they were at how much they enjoyed the final performances. My favourite workshops are actually "Professional Development Days" for teachers where we spend the whole day showing them what we do. They walk in totally baffled and intimidated and they walk out beaming with strong vocal chords and a renewed sense of passion for words. Where do you draw your lessons from? I went to an Arts highschool and studied Theatre and Dance. Then I studied Poetry and Theatre Development at Concordia University. My lessons are a salad of the many techniques and performance/writing exercises which I have developed over the past eight years. They are influenced by all the artists and elders that have influenced me within the Canadian Poetry Community and my studies of many many teachers from Augusto Boal to Jerzy Grotowski to Anna Deveare Smith to Anne Bogart to Joseph Campbell. My overall platform for understanding the world is through the five elements of Hip Hop and I think it's important that every facilitator re-mix what came before them or what they have been influenced by in order to create their own exercises and foundations for teaching. It is important to put your own flavour on it and be original so that as a teacher you may develop your own theories. After eight years of doing so I am still evolving and discovering my methods. I have created many power points over the past three years which have become essential when going into schools because they really respond to the visual. all the other Super Poets call me "Clicker Girl" because I do love my power point clicker and delivering a very slick, entertaining and educational presentation that holds their attention and shakes up their world a bit. I love going into workshops after having developed a new plan that I have never done before, teaching it and then learning from that experience to become better after assesing what worked and what doesn't. The teacher is also the student. I teach according to what is appropriate for my audience. I always like to start with the basics, the history, ancient practices and then bring it into the modern in a way that the audience will be able to relate. Creating safe space is essential. I work in circles with shoes off. I put alot of focus on the body even when we are doing writing exercises because it get's people outside their heads. I also focus heavily on creating rituals that demonstrate how poetry is a gift and rituals that strengthen group dynamics aswell as acknowlege the inter-play between the audience and the performer. I am facilitating a process in which the students meets their own voice and identity in a new way which I hope creates self love and an understanding that we are all connected. Spoken word poetry is the vehicle and the destination is self-actualization. I hope that's not too grandiose and ethereal sounding.